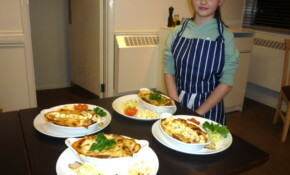 Three teams of Guides and Rangers competed in the cook-off, cooking up some tasty and unusual dishes which guest chef, Bradley Roe said he'd be happy to pay £20 for in a restaurant. On World Thinking Day Rainbows, Brownies, Guides and Rangers speak out about issues which affect them and their local community, fundraise for causes they care about and learn about other countries. Many Rainbows and Brownies will be delivering hand-made Christmas gifts to Island residents, whilst others have been singing or helping other charities. Girlguiding IW members across the Isle of Wight undertook a selection of Parliament related activities within their units during Parliament Week. Girlguides from the Isle of Wight travelled to Wembley this month to be part of an Arena full of Guides enjoying the annual Big Gig. Waving banners and flags, Rainbows, Brownies, Guides and leaders joined the parade winding its way through East Cowes in commemoration of the Women's Suffrage Movement. £772 was raised for Girlguiding Isle of Wight during June, when cyclists using the Bicycle Island App achieved record-breaking 2859km on the Newport-Cowes cycleway. The leader of 1st Ventnor Guides was awarded her Queen's Guide Certificate at a ceremony in the House of Commons.